Batwoman #17 Review – AiPT! 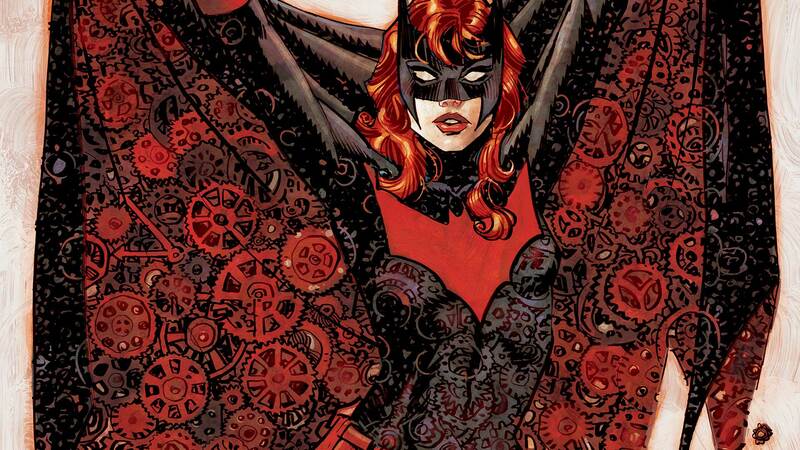 Time is running out for Kate Kane! In this penultimate issue, she and Renee wage battle against Gotham City’s encroaching Kairos epidemic. Time is running out for the Rebirth Batwoman series — both figuratively and literally. Batwoman #17 is the penultimate issue in the series and although it tells an enthralling story, it hardly feels like the end of Kate Kane. Writer Marguerite Bennett begins an entirely new arc, filled with drama, romance, and a plethora of loose ends. This begs the question: how will she wrap everything up in the series’ finale, Batwoman #18? Will Bennett give readers the sense of finality that they crave or will she leave readers wanting more? At the moment, we can’t answer that question. However, we can start building towards an answer. In Batwoman #17, Kate teams up with her old flame Renee Montoya in order to stop a horde of Clockwork Automatons. According to Renne, a crime boss named Kingpin created the robots to sell a drug called Kairos. The drug gives criminals temporary precognition, allowing them to see if their crimes will be successful or not before committing them. Bennett does introduce us to Gotham’s classic villain “Clock King” by the end of the issue, but we don’t get to see a lot of characterization. Bennett brings in the villain and then immediately closes the issue, which makes for a little confusion. On top of that, the Clock King’s promise to “kill Batwoman” falls flat when you realize that he only has one issue to do it. In all honesty, the entire issue falls flat when you realize just how little time Bennett has to wrap up a story that should take at least four or five issues to complete. Still, this isn’t a bad issue or even a so-so issue. I enjoyed reading it and I think most Batwoman fans will as well. If you ignore the fact that the series is ending soon, Batwoman #17 is another great installment in a series featuring one of Gotham’s most interesting characters. In my opinion, the best part about this issue is the presence of Renne. With the whole Batwoman vs. Batman conflict resolved, Kate can finally focus on other things in her life, like taking care of her sister and (maybe) finding true love. While I would have liked to see a romantic interest for Kate who isn’t Maggie or Renee, I’ll take what I can get. There are so few lesbian characters in comics that just having the small amount of romantic tension seen in Batwoman #17 is a big deal. Of course, since the series is ending, Kate and Renee’s days are numbered. I’d really like to see DC create a new series that focuses on Kate and Renne, fighting crime together. Would it sell? Probably not. Would it be an amazing achievement for the LGBTQ community and a kickass series in general? Absolutely. Another element in Batwoman #17 that really helps make this a successful issue is the art. Thanks to the fantastic art by J.H. Williams III in the New 52 Batwoman, Kate Kane has a known reputation for being drawn extremely well. Artists really have to step up their game to compete with past creative teams, and luckily illustrator Fernando Blanco and colorist John Rauch do just that. Blanco’s style is simplistic but beautifully graphic. His heavy linework is reminiscent of the earlier days of comics, back when artists used thick lines and unapologetic shading. While it isn’t everyone’s preferred style, I really like Blanco’s work in this issue. It’s almost like a homage to earlier Batman comics, with the inclusion of a gay female hero instead of Batman. That’s what I call progress. As in Batwoman #16, Rauch brings an impressive palette to the issue. What I found particularly interesting was his attention to the color red. As Batwoman’s signature color, you’d think the issue would be saturated in it. However, Rauch reserves the color red, making its appearances via Kate’s hair and costume that much more jarring. He frequently uses blues and greens to contrast the red, making it pop on the page. Rauch doesn’t have to put so much thought and work into his colors, but he does. His and Blanco’s work really help to make this issue a good one. Whether we like it or not, the looming cancellation of Batwoman colors this entire issue. We know it’s coming to an end, so we can’t help but wonder how everything is going to come together. Will Renne and Kate become a couple again? Will the Clock King get the panel time (see what I did there) he deserves? Will DC keep Kate’s story alive in another series? With all these questions, it’s easy to forget that comics are for enjoyment. So, for the time being, let’s just enjoy Batwoman #17 for what it is: a compelling issue about a compelling character. Because Batwoman is ending soon, it's hard to enjoy this issue without wondering how Bennett is going to finish the whole series. Still, from an individual perspective, Batwoman #17 tells an interesting story that hasn't been told before. Without considering the series' future, this issue can definitely be called successful. Bennett tells an entertaining story that we haven't seen before in a Batwoman comic. The inclusion of Renee reminds readers that Batwoman is a much-needed LGBTQ character. Blanco perfectly channels classic comics in his heavy line work. Rauch uses a sophisticated palette that speaks of the importance of Batwoman's character. Bennett introduces a lot of characters and plot lines in Batwoman #17. With so much going on, I'm not sure how she'll be able to end the series in the next issue.